It is absolutely possible to express yourself with your work clothes; however, if your usual style resembles a Coachella ensemble, you should develop some work appropriate personal style. Accessories are an easy way to add flair without losing professionalism. But even accessories can cross the line into inappropriate territory. Anya Hindmarch’s Fall 2015 collection reminds me of when I first studied in France. There was another American student who took photos of every sign around Paris. 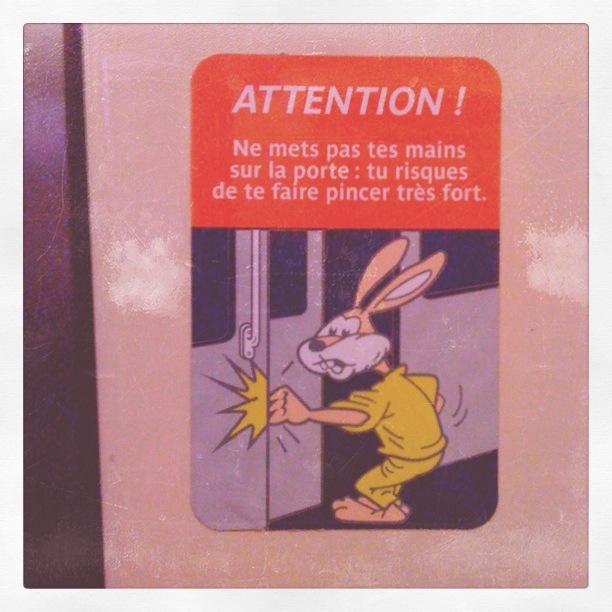 Sure, the metro stickers of a bunny getting its body or fingers caught in the door give cause for doubletake, but I did not share his signage proclivity back then but I’ve since developed a love of typography and individuality. Particularly in a time when knock-offs and post-parody trademark infringing designs are ubiquitos, Anya Hindmarch’s line inspired by driving signs feels refreshing. From the easy to identify signage like “No U-Turn,” or “STOP,” to graphic arrows, Hindmarch’s accessories and ready-to-wear are playful yet powerful statement makers. Would you dare to wear Hindmarch’s designs to your job? Two of Hindmarch’s bags (here and here) remind me of elementary school trapper keepers but she otherwise has a backpack and purse that I love. Her line includes interchangeable leather purse stickers from eyes and numbers to a Miley Cyrus style Tony the tiger and some that depending on placement may get you written up by HR. If you prefer a preppy look, Hindmarch also has a striped tote. I love the idea of leather bag stickers! I would definitely play with Anya’s line and hadn’t heard of it until now. Cool, I’m glad to have introduced you to something new.